Oh, what fun – an easy felt crafts fringed felt heart to make for Valentine’s Day, give to a friend or use as party decorations. 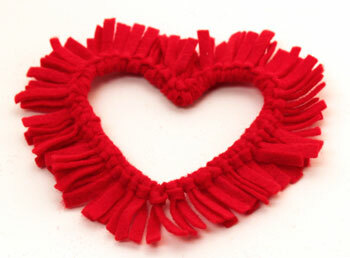 Take a look at the simple fringed felt heart that can remain simple or be embellished with whatever you have available! Another slightly larger version celebrates Valentine’s Day with the addition of a cut-out portion of a child’s Valentine’s card. The inexpensive materials and tools along with the simple steps to make this fun and easy crafts project can be found on our page: easy felt crafts fringed felt heart. With some size increases, the project can easily be translated into a larger heart shape for a door-sized wreath. Plus, this project is great for children to do after an adult helps with the first few steps. Actually, their smaller fingers are better at adding the felt strips to the wire! 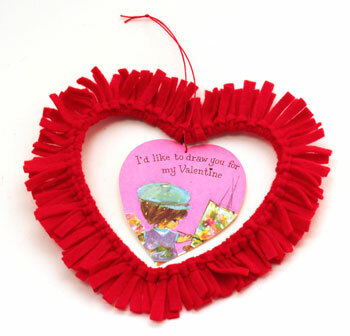 Have fun making the easy felt crafts fringed felt heart and adding embellishments to make it uniquely yours! He (or she) may be made with buttons and felt, but the button snowman ornament is a no-sew project. Instead of needle and thread for the buttons, glue will hold the buttons to the felt. Let’s look at four simple yet cute little snow persons! Each small ornament uses two small pieces of felt – one white and one complementing the button colors, three buttons and a short piece of yarn or thread. Inexpensive craft felt can be found in 9 x 12-inch pieces. Inexpensive buttons can be found in mixed bags in the craft areas of stores or in flea markets. The inexpensive materials and simple tools allow you to make several of these ornaments for very little cost. Plus, these little ornaments are not just for the holidays. They can be a fun project for a snowy afternoon for children or the young at heart at a senior center. They’re fun little button snowman ornaments to make. Of course, if you prefer to sew, these little button snowman ornaments would be lovely with the buttons sewn on and the two pieces of felt held together with stitches around the edge. Head over the the button snowman ornament page on the main website to find the simple pattern and the illustrated steps on how to make the button snowman. Hello again, it’s been a while. I’ve been off on another project that took lots more time than I expected. But, I’m ready to start adding more easy and inexpensive craft projects to www.funEZcrafts.com. 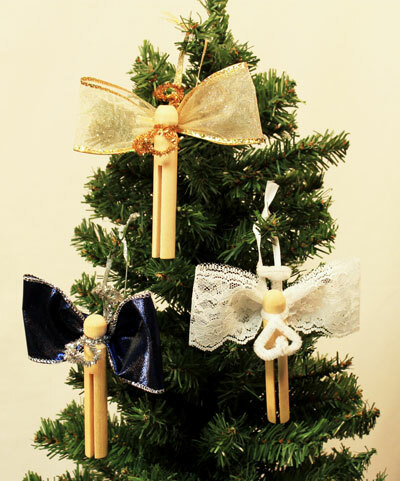 Here’s a recent addition that’s simple, fast and cheap – a clothespin angel. 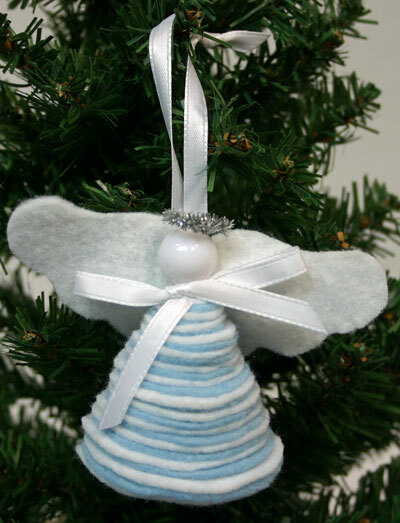 A little bit of ribbon or lace, a clothespin (real or craft) and a chenille wire makes a pretty little angel to hang on your Christmas tree or decorate your home for other holidays. They also make easy decorations to add on gifts instead of or in addition to ribbons and bows. The little clothespin angel would be an additional keepsake with your gift. These pretty angels can add beauty and maybe a little whimsy all year – not just at the holidays. Head on over to the Clothespin Angel page for the materials list and the how-to steps with accompanying pictures. This angel is simple, yet pretty, and is made using inexpensive materials, common tools and a little time. This pretty angel easily hangs on a tree or sits on a table. It can also embellish a wrapped present and be an additional gift to the recipient. Make one or many using the same or different colors. You’ll find the instructions and the pattern on our web site by clicking here: Felt Circles Angel.